Following the Archbishop's wonderful announcement that "our" beloved St Mary's Cathedral would reopen on 8 December 2009, commencing in August 2009, Archbishop Hickey and Monsignor Keating invited and welcomed small groups of valued supporters and generous donors to join them for a personal tour. These tours were an opportunity for His Grace and Monsignor Michael to acknowledge the outstanding support and generosity that so many had afforded the Cathedral Project and Appeal. 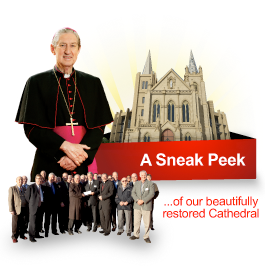 Guests had the rare opportunity of seeing first-hand, the magnificent progress of the restoration and completion works undertaken at the Cathedral over the past 3 years.